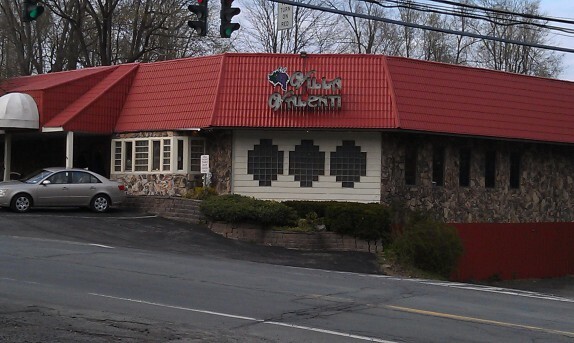 On recommendation from my buddy, MetalFrog, on a weekend my brother came to town, we went to eat at Villa Valenti (369 West Sand Lake Road Wynantskill, NY 12198). The interior of the restaurant definitely has that old time Italian restaurant feel, and, while we were there at 6PM on a Saturday, the restaurant was packed with a number of families, all parties larger than 5 or 6. 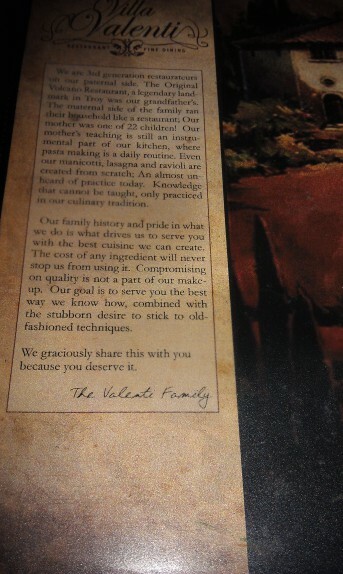 It’s a family owned place that speaks a lot about its pride and dedication to quality. I was actually looking forward to the meal very much because it really had been a while since I’ve had some great Italian (American) food. 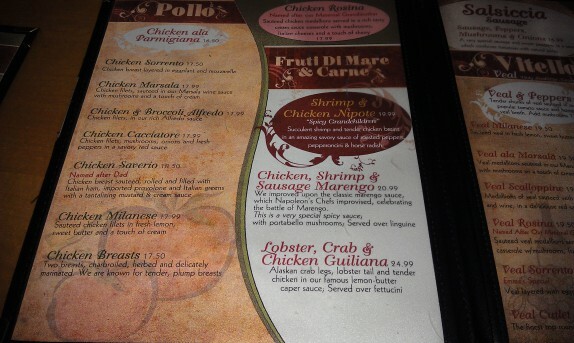 When figuring out what to order, I was focused on the chicken page in the menu. As with most Italian (American) places, they have Chicken This and Chicken That. The Chicken Rosina – (medallions with a cream sauce with mushrooms and sherry – $17.99) seemed like something that popped out from the menu, so I had that. 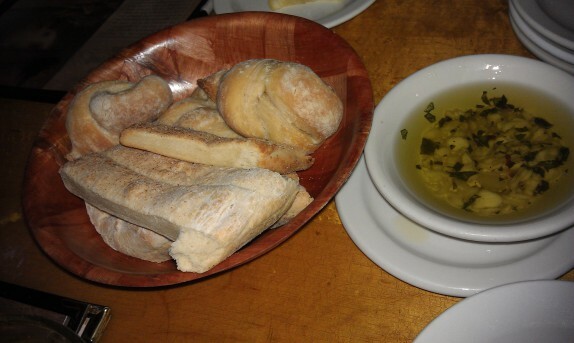 But not before sampling some of the clearly homemade bread and garlic olive oil that was served on the table. 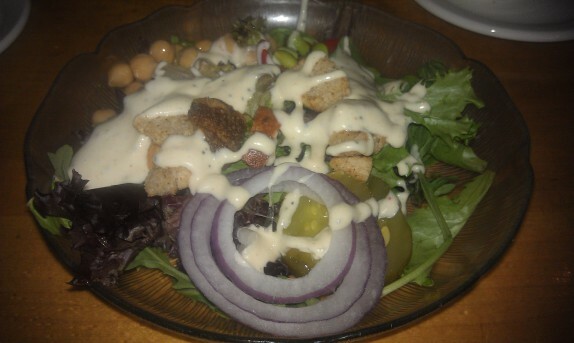 And also not before having a small serving of things from their salad bar, which had the essentials and plenty of them. It was also remarkably on the clean side for salad bars. 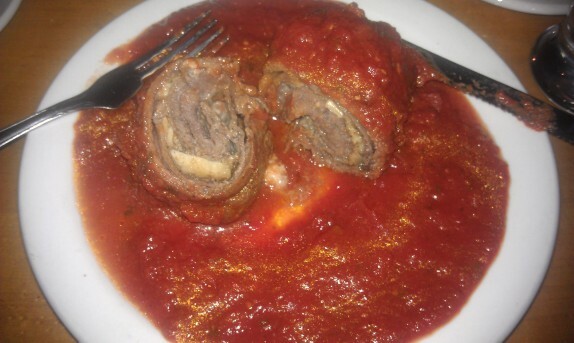 I had actually ordered a brasciole appetizer (steak rolled and stuffed with cheese and spices – $8.99), and that arrived pretty quickly after placing the order. That's a lot of sauce! I cut across to see if the cheese had all melted away. 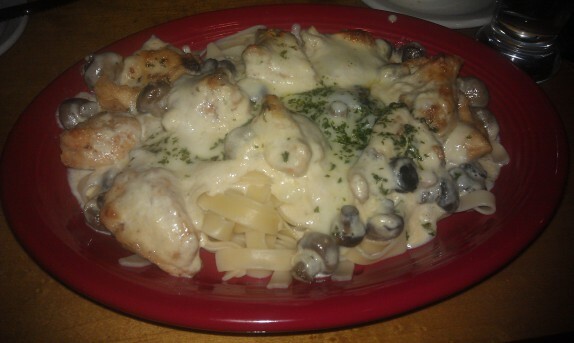 I did enjoy this dish very much. There was way more sauce than needed to be there and it was a little on the dry side, but, aside from those minor things, I thought it had a great amount of flavor. The cheese was clearly not a typical mozzarella, and the inside of the roll was seasoned nicely with salt and pepper (a liberal amount of pepper being a must for braciole). My experience with the main course was less positive. On the surface, it looked great, but it was pretty flavorless. The chicken medallions were cooked perfectly, but were barely seasoned. The cream sauce bringing everything together also lacked seasoning. You could taste the sherry in the sauce, but, without some saltiness, the texture of the sauce just left a flat, bland taste on the tongue. The mushrooms also suffered from the same issue and didn’t add much to the experience. It wasn’t the worst thing on the planet, but it could be better. The fettucini pasta that was the base of the dish was actually a substitution. Most dishes come with one type of pasta (boxed, I’m assuming), but they charge a small fee to upgrade to their homemade pasta. That’s what I did, but it came out really overcooked. I didn’t mind much because I don’t bother much with pasta anyway. The service for the evening was excellent. The young man who waited our table was super accommodating to our party. There was a bit of a misunderstanding of the presentation of the dishes. Before ordering, when I asked about how the pasta was served with my dinner, he said it would be tossed in the cream sauce and used as the base of the dish. We had assumed this to be the case for all of the dishes, but Cassie’s chicken milanese came with a plate of pasta with red sauce on the side, even though her chicken had a plentiful amount of its own sauce. When we flagged up her tomato allergy to him and asked for a plate of dry pasta that she could eat with her sauce instead, he was unnecessarily apologetic and willing to accommodate the request. We didn’t opt for any desserts there because The Snowman was calling our names, but the dinner was filling and decent while the company and atmosphere was awesome. 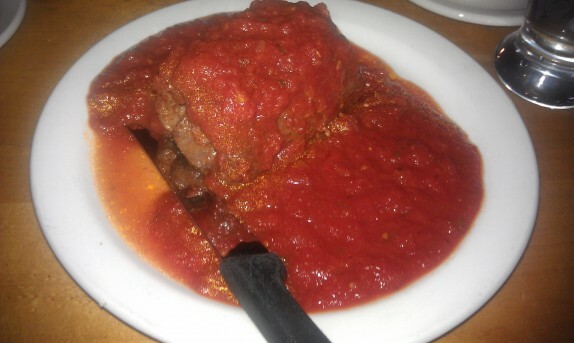 And what this place is really good at is providing a relaxing setting to eat some large portions in great company, the way an Italian American restaurant should be. You are of course correct in avoiding most Italian-American restaurants in the area, and I agree with your reasoning. It IS dull and uninspired, and trends toward comfort food with its huge potions and fairly simplistic flavor palette, as opposed to stretching the boundaries of what the cuisine is easily capable of achieving. And really, is there that much difference between the touted ‘authentic’ Italian establishments (such as Café Capriccio and Villa Italia) and places like Villa Valenti or its Wynantskill neighbor, Paolo Lombardi’s? Sure, the quality of ingredients may be slightly better and they are prepared with more skill, but are they really doing anything that innovative? Don’t get me wrong, what they do, they generally do very well – their longevity alone is testament to that. In many ways, I think they are stymied by dint of geography, and unavailability of quality ingredients at an affordable price to use in preparation. Sure, you can buy a pint of extremely high quality olive oil imported from the old country, but it’s going to cost you dearly making it infeasible to use in a commercial setting. That same oil is third or fourth rate stuff in Italy; the majority of balsamic vinegar one sees in a supermarket here (you know, for $4-5 a quart) would be distilled down into cleaning fluid over there, unfit for human consumption. Let’s not even touch upon seafood. In my opinion, it’s why painfully simple dishes, like pasta al’amatriciana can’t be duplicated here in a restaurant – we can’t access the pecorino, guanciale or olive oil indigenous to the Lazio region (not to mention the town to town/village to village variations upon the theme). In some instances I may go even further and argue that unless you’ve been there, and had direct access to their products and had them prepared in a traditional manner, you can’t begin to fully appreciate what an ingredient like paddraccio cheese is or tastes like (and yes, I’ve been in Basilicata and tasted it). I understand the bottom line, and need for profit. But it’s this rationale that keeps 98% of Italian-American restaurants heaped into a pile of decent mediocrity. It’s also what keeps me from patronizing them by and large, keeps me cooking at home using as much affordable locally sourced produce as I can be bothered to fetch, and it’s what makes me travel.